Workman Publishing, 2017. 250 pages. 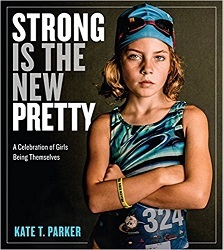 Strong Is the New Pretty is a book of photographs of girls being strong – and they are indeed beautiful. The text accompanying the pictures isn’t exactly geared to children. There’s an introduction, and then nine chapters, with titles “Confident is Strong,” “Wild is Strong,” “Resilient is Strong,” “Creative is Strong,” “Determined is Strong,” “Kind is Strong,” “Fearless is Strong,” “Joyful is Strong,” and “Independent is Strong.” Each chapter has an inspiring explanation at the front of how these pictures fit with the theme. Every photo has a quotation from the featured girl. Cancer stole part of my leg but not my joy. I choose happiness. Being happy is my superpower. Leaf jumping is the best. Through music I have the ability to make others smile and even cry when I perform in a way that moves someone. She had a knot in her cleats. I’m really good at untying knots, so I helped. Yeah, I am a little muddy. So what? The quotations aren’t usually profound, but the photographs are stunning! And I love that the photographer gave each subject a voice. In the Introduction, the author explains how the project got started. This photo series started as a personal project. I work as a professional photographer, but I’m also a mom (the mom with the giant camera and bag of lenses at most events). And it’s not uncommon for me to be photographing my girls and their friends – constantly – when they’re riding their bikes, at soccer practice, or exploring tide pools while on vacation. The more I shot, the more I began to notice that the strongest images, the ones that resonated most with me, were the ones in which the girls were being 100 percent themselves. When they were messy and funny and stubborn and joyful and in your face, I kept shooting. I didn’t ask them to smile or go put on a pretty dress. I wanted to capture these girls as they were, and how they were was amazing. I wanted to continue capturing them in just that way – not just for my sake, but for theirs, too. As a body of work emerged, I kept at it with more intention. I wanted to show my girls that beauty isn’t about being a certain size, or having your hair done (or even brushed, in their cases), or wearing a fancy outfit. I wanted to combat the messages the media sends to women every day. I wanted my girls to know that being themselves is beautiful, and that being beautiful is about being strong. I strongly recommend checking this book out and enjoying the beautiful images. And I even more strongly recommend sharing them with your daughters. Talk about them. I’m guessing they, too, will see how pretty these strong girls are. Ten Speed Press, 2017. 352 pages. This book is amazing! Amazing and wonderful. Mihaela Noroc has traveled the world and taken pictures of women – beautiful women. These beautiful women come in all colors and sizes, young and old, dressed formally or casually. There is even at least one transgender woman. Many are not what you would call traditionally beautiful. But when you see them through the photographer’s eyes, you know – every one of these women is beautiful. They come from countries all over the world. As an example, one of the collage pages has photos from Ethiopia, China, Singapore, Germany, France, Spain, Nepal, Uruguay, USA, Switzerland, Mongolia, Greece, Romania, India, Portugal, Chile, Sweden, and England. Another collage has pictures from Uzbekistan, Egypt, Cuba, Portugal, Tajikistan, Netherlands, Italy, Russia, Germany, Peru, India, Greece, Guatemala, Russia, Nepal, Argentina, England, Turkey, South Africa, Colombia, Ethiopia, China, Spain, and Mexico. And these women are indeed beautiful. This photographer makes the viewer see beauty in even the most old and “plain” women she features. The book does remind me of Humans of New York with little stories of each portrait subject. After her mother was diagnosed with cancer, Katariina started to see life in a different way. For years she had worked in the perfume industry, but her mother’s illness made her think more about health issues related to beauty products, and to want to do something. 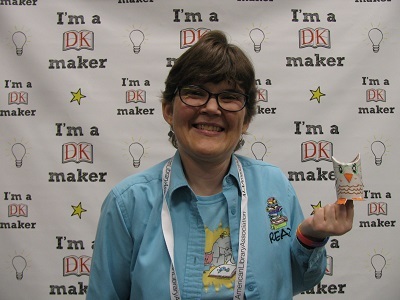 She gathered a team of specialists and created an amazing free phone app that scans the barcode of a cosmetic product and informs the user about the safety of the ingredients. After studying in the United States and England, this young Palestinian returned home to put her knowledge in the service of Palestinian people. Raya was pregnant with her second baby when I met her, but besides becoming a mother for the second time she was also on a mission to empower Palestinian women. As a young entrepreneur, Raya started a cosmetic company, and most of her employees are Palestinian women from marginalized communities. She also works for Palestine’s largest bank, and one of her main projects is to increase the percentage of female employees in all ranks at the bank. I met these sisters, Monica, Francesca, and Rosanna, in their hometown, though now they all live in different parts of Italy, far from one another. They had reunited to visit their mother, and spend some time together. When I met Rachelle, she was glowing with pregnancy and the city’s late afternoon light. The book actually doesn’t need any text at all to be stunning. 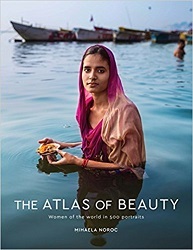 Though it’s also amazing how many different places on the globe she traveled and took pictures of women. 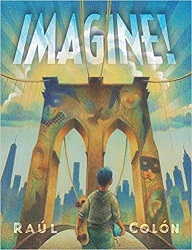 This book is marketed and produced for adults, with very small print in the captions. But if I had a young daughter in my home, I would be sure to purchase this book and place it where she could easily browse through it. Now that I think about it, if I had a teenage daughter in my home, it might feel all the more important. As it is, I’m going to purchase my own copy to remind myself that Beauty comes with many, many different faces. Looking at this book made me feel part of a sisterhood of women from all over the globe, part of the human family. It reminded me that we come in all shapes and sizes and ages and colors. And we are Beautiful. Godwin Books (Henry Holt and Company), 2017. 36 pages. 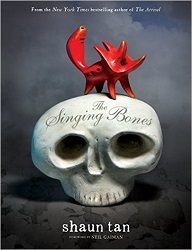 This is another book in support of the Eric Carle Museum of Picture Book Art, like What’s Your Favorite Animal?. Here again, a set of distinguished illustrators are asked a simple question – and they all answer in their own unique way. The color I choose will surprise you because it dares to be different. No matter what others may say, artists know that gray is magic. It gets along with all the other colors and knows how to make them sparkle. Gray is smart and UNIQUE! Like the clever octopus, my good friend gray knows how to change colors to communicate. It comes in many different shades – from warm to really cool! In some parts of the world, this flexible color even changes its spelling to grey. When things get noisy and mixed up, gray is like a calm, deep breath. My favorite color is Mint because I love mint chocolate chip ice cream. I love the way the snow magically paints the world white. I love flaming orange. It is the color of the tiger burning bright as it creeps through the grasses of the jungle. This isn’t a book for preschool storytime, but it is a book for thoughtful reading over and over again. It’s for looking at things differently. It’s for thinking about your own favorite color. And it’s for enjoying the glorious paintings. I’m not sure why they chose the order they did of the illustrators, except the obvious choice of putting Eric Carle first. The colors aren’t in the order of the rainbow, and a few colors are almost the same. (For example, Melissa Sweet chooses Maine Morning Gray.) At the back, there’s a bit about each illustrator, and the names are in a colored font. I find myself wishing they had used each illustrator’s favorite color for their name, but they didn’t. All the same, this is a lovely book. 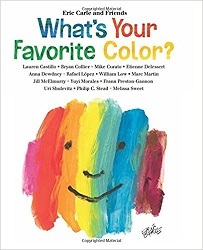 It would be perfect for sharing with a budding artist to get them thinking about and seeing colors with fresh eyes. and apples can be green. 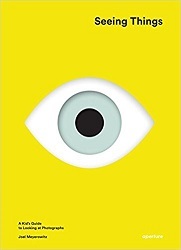 This is a book about photography – and about becoming a better photographer by learning to see as a photographer does. The bulk of the book is a series of great photographs, chosen by Joel Meyerowitz, who is a photographer himself. They are mostly not images I would have chosen – they aren’t necessarily pretty pictures – but they are consistently images that make you think and wonder, if you stop to take a second look. On the accompanying page to each photograph there is some text pointing things out, but also asking questions. The author explains why each one is a great photograph and explores why it captures your attention so effectively. The earliest photo in this book was taken in 1898 and the latest in 2014. 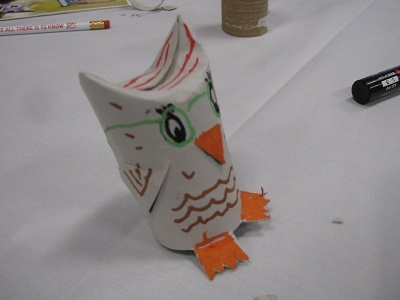 There are a wide variety of subjects and styles. The selection alone is provocative and will get you thinking about what you would choose for a collection of outstanding photographs. These photographs, of people and animals, of landscapes and life on the street, are full of humor, mystery, and surprise and show that any moment of any ordinary day has the potential to activate your mind with a sudden flash of insight. That moment of seeing is like waking up. How lucky we are to be living in an age when making a photograph is available to everyone with a smartphone or a camera. The photographs that follow show the kinds of tools that photographers use, like intuition, timing, point of view, a willingness to wait, and the courage to move closer – tactics that make beauty and meaning, otherwise hidden, visible. All of these things are part of how you naturally see, but you have to be aware of them if you’re really going to see. What you notice will reflect the way the world speaks to you, and only to you. You may or may not be able to change the world, but the world can certainly change you. 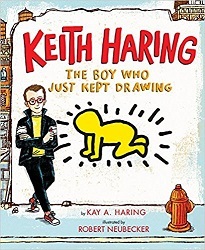 This book calls itself a kid’s guide to looking at photographs, but anyone of any age who takes pictures will learn from considering the ideas in this book. Random House, New York, 2015. 262 pages. 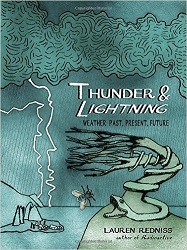 Thunder and Lightning is another Science Picture Book for Adults by the author of Radioactive. As with Radioactive, which is a biography of Marie Curie, Thunder and Lightning is full of facts – but the most striking thing about it is the dramatic pictures. I can’t really describe the pictures adequately, so I’m going to focus on the words here, but be aware that if this is a book you find interesting at all, you should check it out and see for yourself. 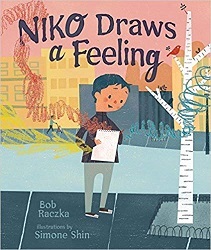 The author explores so many aspects of weather! Mainly she tells weather-related stories, but there are also many things about the science of weather. Some of the stories told include a cemetery washed out by a flood, the secret forecasting formula used by Old Farmer’s Almanac, people struck by lightning, a ship that sunk in fog, swimming from Cuba to Florida, devastating fires in Australia, a World Seed Bank in Svalbard, the ice trade on Walden Pond, and making rain in Vietnam. This perhaps gives an idea of the wide range of topics covered here, which all relate to weather. The author relies heavily on quotes, which bring an immediacy to each story, each exploration. The daylight is negligible; and the moonlight, which comes to you first through clouds that are high in the sky and later through an enveloping fog, is a light which enables you to see your dog team distinctly enough, or even a black rock a hundred yards away, but it is scarcely better than no light at all upon the snow at your feet. I think my favorite chapter, though, is Chapter 7, “Sky.” After fascinating ramblings and explorations on various topics, I turned the pages on “Sky” – and discovered 16 pages of paintings of sky. Lovely. This book is surprising and hard to describe. Check it out and see for yourself.